Holmes County, Ohio contains the world’s largest Amish population. Situated almost equidistant from both Columbus and Cleveland, Amish Country seems worlds away from the hustle and bustle of city life. Amish children peer at passing cars from rear buggy windows. Amish businesses use skylights and generators to provide enough light and power to open shop. 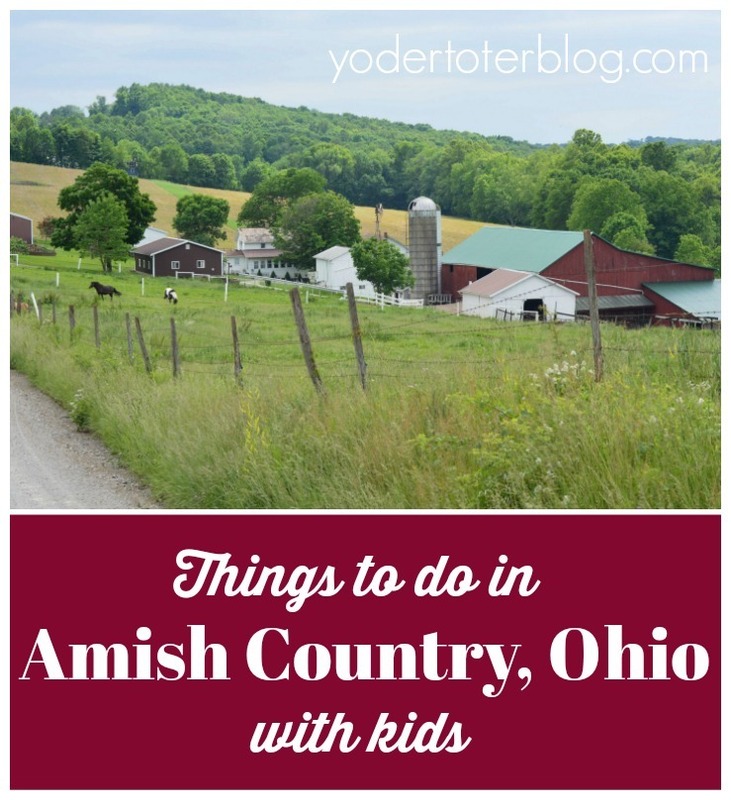 Amish Country is a great place to visit with kids because it evokes a lifestyle they probably know little of. There are culture and great food for the adults, but farm animals and tasty sweets for the children. 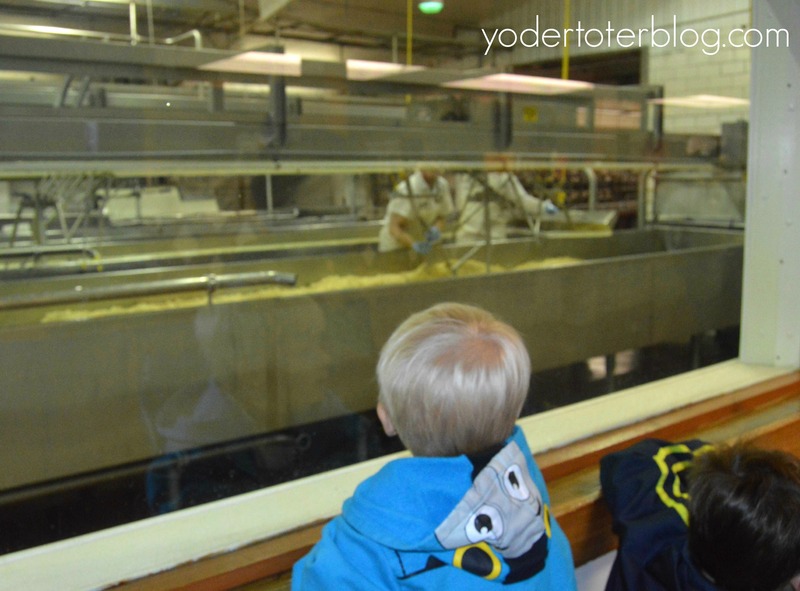 Here are 5 things to do in Amish Country with kids. Hershberger’s is located less than a mile off of SR 39 between Millersburg and Berlin. Hershberger’s Bakery has all the Amish goods you would come to expect- pies, cinnamon rolls, and canned goods. The farm store sells fun products your children will love, like Amish dolls and wooden farm toys. (Side note: The dolls have no faces because the Amish believe the doll then becomes a graven image. They also believe it is prideful. That is why you’ll notice you really never see a photograph of Amish from the front, usually of their back as they walk or plow). The petting zoo was an absolute delight to our children. Some of the goats were a little aggressive, but harmless. One of our favorite activities is a buggy ride! The drivers are always very friendly and willing to answer any questions you may have about the farm or their Amish lifestyle! The Farm at Walnut Creek is a unique experience for visitors because it combines an exotic animal farm with a working farm. After feeding the giraffes and zebras, you may pet something simpler, like a goat. If the weather allows, I recommend taking an Amish-led tour by horse and buggy. 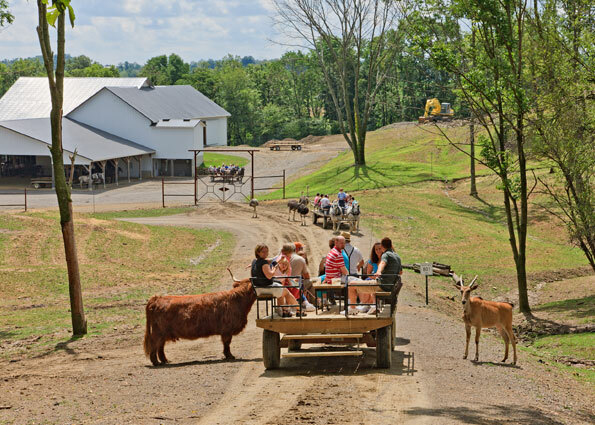 This 2.3-mile wagon tour will allow you even more interaction with the animals. Our favorite time at The Farm is during their Fall Festival! They offer a pumpkin slingshot, a giant “cornpit,” and a tower made of hay! It’s a really special time for families, with plenty of photo ops. One thing to note The Farm at Walnut Creek is closed on Sundays, and they do NOT accept credit or debit cards, so plan accordingly. 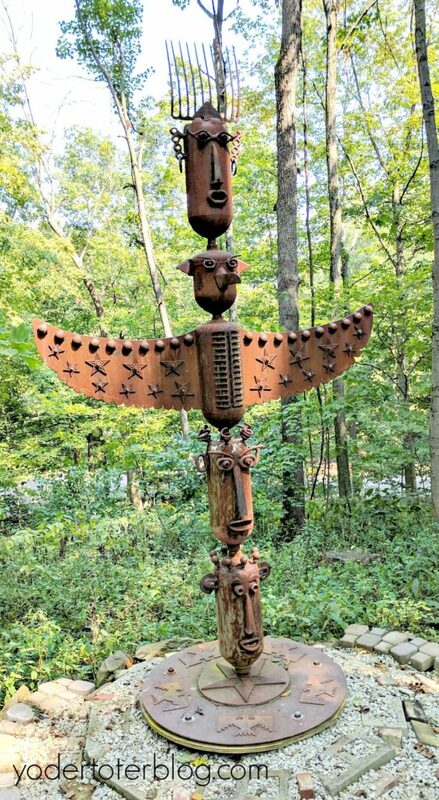 While the Inn at Honey Run in Millersburg caters more to the kid-free traveler, also on the grounds of the resort lies Holmes County’s Open Air Art Museum. This 1.5-mile trail is a fun place for families to connect with nature AND study art. When you arrive, visit the hotel lobby and pick up a trail map! Throughout the trail, there are large boulders with haiku poetry listed in both English and Japanese. This is a fun learning opportunity for young kids! Do note, the trail is very hilly and not stroller-friendly. If you’re traveling with young children or babies, you may want to consider a hiking pack or baby carrier. You can read more about our visit to the Holmes County Open Air Art Museum HERE. Heini’s Cheese is an Amish Country staple and has been since the 1950s when it was Bunker Hill Cheese. If you’re looking for a fun (and tummy filling) stop for the whole family, Heini’s is the place to go. From hot pepper to butter to blue, tourists are allowed to sample numerous cheese varieties! Right next to the samples are windows which allow you to view the cheese being made. The factory is usually active Monday, Wednesdays, and Fridays, but call ahead if you want to make sure you pick the right day for your visit. Note- the sampling area is pretty tight. We pushed a stroller through, but we were visiting in the off-season. If your kids are like mine, they hate shopping. One more furniture or craft shop may send them over the edge. You may be able to change their perspective at Lehman’s Hardware in Kidron. There is a LOT for adults to look at – after all this is the premier shopping spot for homesteaders and those desiring a simpler life. However, Lehman’s also has unique items, like cookie cutters to fit every holiday, bottled sodas to fit every taste and a unique toy area. A trip to Lehman’s may produce a little whining but could create memories for years to come. Buy a six-pack of sodas and have a family taste-testing. Purchase a few cookie cutters to create the perfect cut-outs for an upcoming holiday. And before you go, grab a picture in the old jail cell or while trying on an Amish hat. 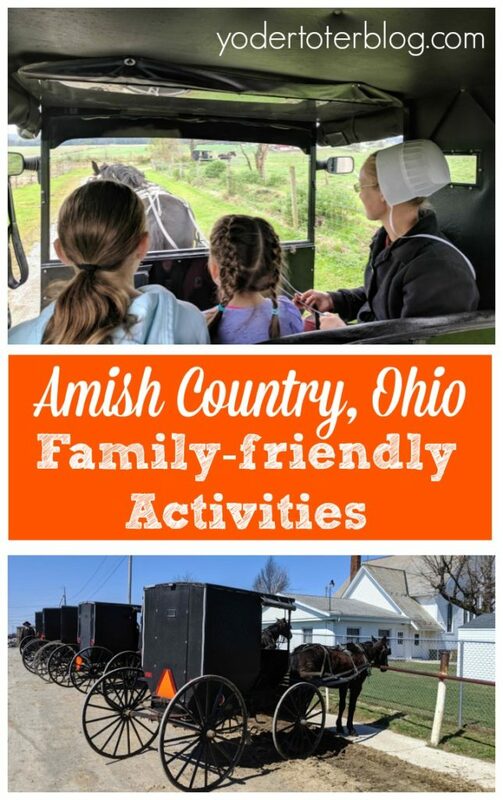 If you’re looking for FREE things to do with kids within an hour of Amish Country, look no further: 3 FREE things to do within an hour of Amish Country. Restaurant suggestions? I also have you covered! Click HERE. 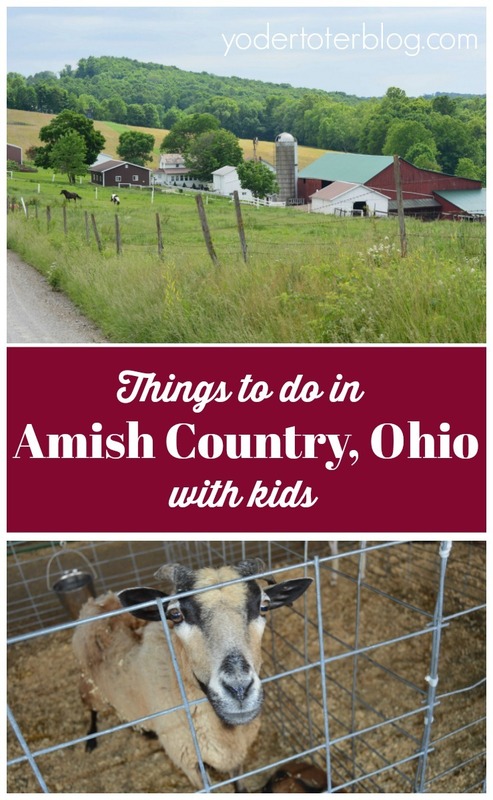 Have you been to Amish Country with kids? What’s your favorite thing to do? I love taking my daughter to the little outdoor village at Berlin resort. She played at it for hours. I even played in it with her. I highly recommend Berlin resort . Cool! I’ve never stopped there because I didn’t know if you had to stay at the hotel in order to play there. Were you a guest at the hotel?